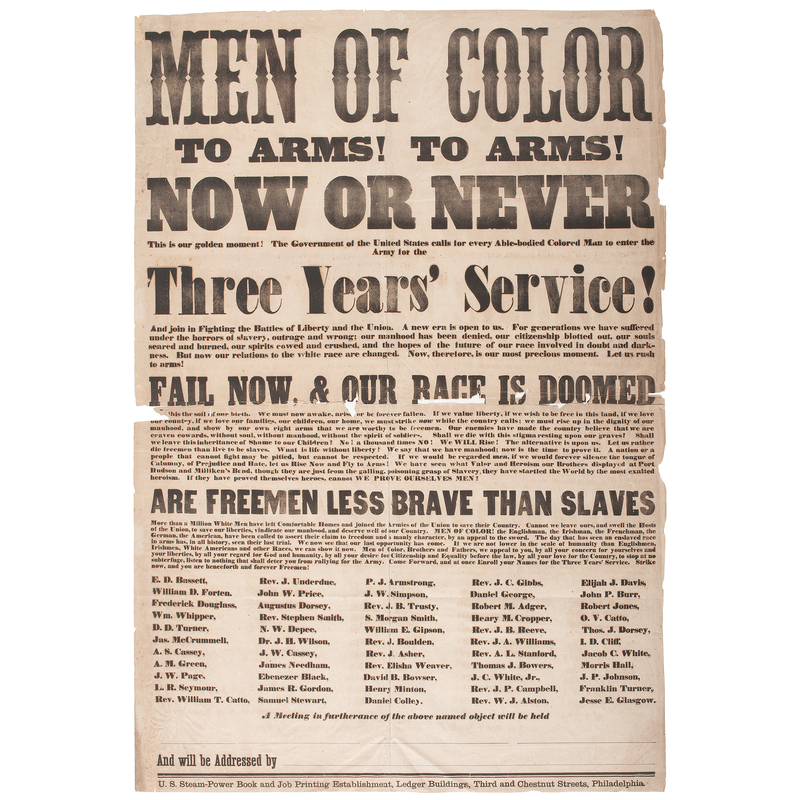 Printed broadside, 29.5 x 41.5 in., calling all men of color to arms, Fail Now and Our Race Is Doomed....Are Freemen Less Brave Than Slaves. It also lists the names of speakers at a meeting that includes Frederick Douglass. Printed by the US Steam-Power Book and Job Printing Establishment in Philadelphia, PA.
Frederick Douglass advocated for black men to enter in the service and fight to free the slaves. He published many articles and performed many orations urging politicians to allow African Americans to fight alongside white soldiers. Politicians resisted until Lincoln delivered the Emancipation Proclamation in 1863. Permitted to act on his desires, Douglass traveled across the country imploring men of color to enlist. Fragile condition with two horizontal and two vertical folds, damage to the center fold with missing portions of the text., toning of the paper, and some brittle edges.